After I installed Acrobat Professional 9 on one computer, I tried to run the updater. I got this message: A new version of the Adobe Updater is available for installation. Click on OK to install it now. If I clicked on OK, it downloaded the new version and tried to install it. 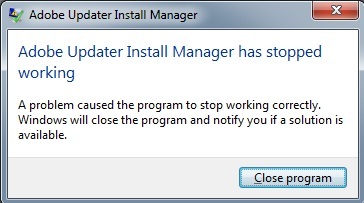 However, the installation of the new updater failed, and I got this message: Adobe Updater Install Manager has stopped working.